Who could be immune to the charms of the big eyed skippers that visit our gardens all summer and into the fall. Certainly not me! Skipper is the perfect name for these fast, agile, erratic fliers and seem to skip from flower to flower. Can you see the clubbed antenna? They look more like moths then butterflies, but, they are indeed butterflies. Skippers are small to medium, usually orange, brown, black, white, or gray. Some are brighter or iridescent colored. They all have those large eyes (even their caterpillar has a large head), short antennae (often with hooked clubs), stout bodies, and three pairs of walking legs. Adults of most species have long probicscises and feed on floral nectar. Although, not as efficient as bees, skippers and other butterflies, play a role in pollinating day blooming flowers. Some skippers are specialist, but, the ones that frequent my garden will visit every flower in bloom. 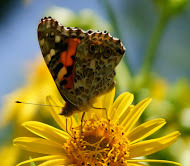 Butterflies in general, tend to favor big, fragrant, colorful flowers with someplace for them to land. Skippers seem to land on the flat composites and even the tubular False Dragonheads and other flowers with perfect ease. Pollination is incidental! Skippers are there for the nectar. While they're sipping nectar a few pollen grains will stick to their legs and be carried to the next flower on the plant-resulting in pollination! Lucky for those of us who like our plants to go to seed and spread their offspring around the garden. That’s one reason large swaths of flower make sense ~Pollination will be more successful then if you have a plant here and there. All pollinators need to find plenty of food in one area from a wide array of flowers that are in bloom during the spring, summer, and autumn. Skippers are members of the Superfamily Hesperioidea. We have about 275 in North America; many of which are found only in Arizona and Texas. Middle Tennessee, where I live, has approximately 50 different skippers~ and I am thrilled to be able to identify three of them! Thrilled also to be in the company of experts who admit that they have trouble id-ing them~Except in the lab and we aren't going to harm any skippers to get an id! I'm not too concerned about not being able to identify them. I do know, that I want them in my garden. They are important plant pollinators; they are part of the garden food chain, as consumers and food; and, because of their sensitivity to environmental toxins they are an important indicator species of ecosystem health. If you have an abundance of skippers and butterflies~you probably have a healthy garden habitat. Since they are almost all plant generalists and many of them share the same host plants~planning a habitat that will attract butterfly/skippers is not difficult. Almost all of the plants we plant in our garden to attract native bees, are just as attractive to butterflies. In fact, any well designed wildlife habitat will be a perfect environment for bees, butterflies, flies, moths and other pollinators. Nectaring on Caryopteris-See the proboscis, its long, flexible "tongue." You can visit any number of sites on the internet to find out which plants make sense for your garden. I recommend you visit the Pollinator Partnership or the Xercis Society for even more information about pollinators. You can also get my newest 'go to book', Attracting Native Pollinators. It's a fantastic resource, but, you don't have to take my word for it. As Douglas Tallamy says, this book "belongs on the bookshelf of everyone who values the future of the natural world." Of course, you already know what I am going to say here! 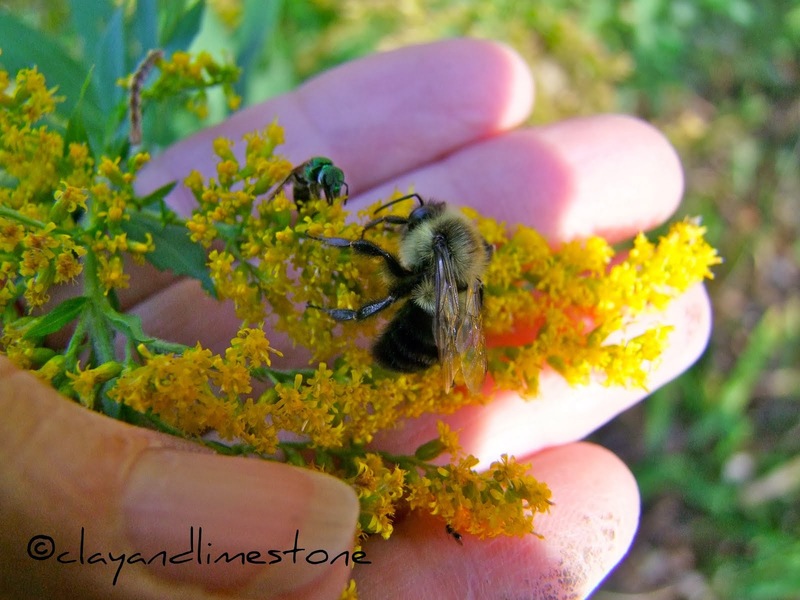 If you want to attract pollinators~Never, never, never, ever, use pesticides in your garden. And, they look soft enough to pet. Great shots Gail. They were looking you right in the eye. Gail - Your photos are just extraordinary - love being able to see those clubbed antennae! That shot with the false dragonhead is especially lovely! So ugly they are cute! So far, so good with my gardens as I have a lot of them hanging around in the summer.. They are just the sweetest little things. I swear in that first photo, the skipper is posing for you and smiling, Gail! Although I'm learning more and more about butterflies and moths, I know so little about them. Thanks for sharing all this helpful information about the skippers. They are frequent visitors to my garden, and now I will welcome them even more knowing how important they are in the pollinator world. Great post! I always thought skippers were a separate entity, not a true butterfly...I learn something new everyday! I love skippers. We were bursting with them at the end of last summer. They were all over everything from basil blooms to our heirloom sunflowers. I can't wait to see as we add more flowers to the garden, how many more show up! Not only are skippers wonderful, they have the cutest name. :) I'm excited to dig into your native plant links 'cause I've got me some big plans in the works for this gardening season. I'll take Horace Dusty Wing, colour coded to the chocolate brown heart of the 'daisy'. In the birding world we refer to Skippers as the Empies of the butterflies. You see the Flycatcher Genus Empidonax (Empies for short) are the most frustraingly similar flycatchers in the bird world. Like the Skippers they have such similar markings and are difficult to differentiate = frustrating. Yet they are all beautiful. We can just enjoy those big eyed pollinators anyway. Thanks for the info and the great photos! I always enjoy seeing them skip about from flower to flower! I can never identify skippers, but I love seeing them! They seem so cheerful. Good stuff and lovely photos, dear Gail. I'm going to keep a closer eye on these cuties! You must be really sneaky, and/or really patient to get such awesome photos. Great information too. What amazing photographs! I have been thinking a lot about pollinators because the New England Wildflower Society is having a container planting competition - Native Buzz - and the research to design a container for specific pollinators is challenging. Great post. Your blog is one of the reasons I have a couple of asters growing on in the greenhouse to extend the attraction for the wildlife. Was happy see I have a lot of the plants on your list, which seem to work just as well here in the UK. I would like to find the time to get better at identifying by insect visitors though. Loved your exploration of skippers. I am happy to say that I have tons of them in my garden, which is completely organic as is my nursery. I can't believe they held still long enough for you to get such good photographs. I am a big fan of Doug Tallamy--his book Bringing Nature Home is excellent. Fantastic photos. Those really are some big eyes aren't they! Oh Gail, This is an award winning post! Your photography is stunning. Truly magical light and who could not fall in love with these wonderful skippers. Great links too! Fabulous series! Thanks! Gorgeous photos! These little guys are sweet in the garden. Love the photos Gail! I've been immensely enjoying this series of posts on pollinators. As our garden continues to mature, it's such a joy seeing more and more pollinators visiting us every year. They are under such stress in our 'modern' world, it's a beautiful thing for us gardeners to provide them with habitat and refuge. I enjoyed your post. I'm glad to hear my habitat is healthy. I think that's the word you used. I tend to have lots of skippers. I see more skippers than butterflies. I also have lots of bees and wasps. I miss them and the flowers so much during the winter. What a great series! It's such a great thing to promote support for pollinators in your garden. Ooh, and I just noticed your link to the Xerces Society's new book -- need to get that!